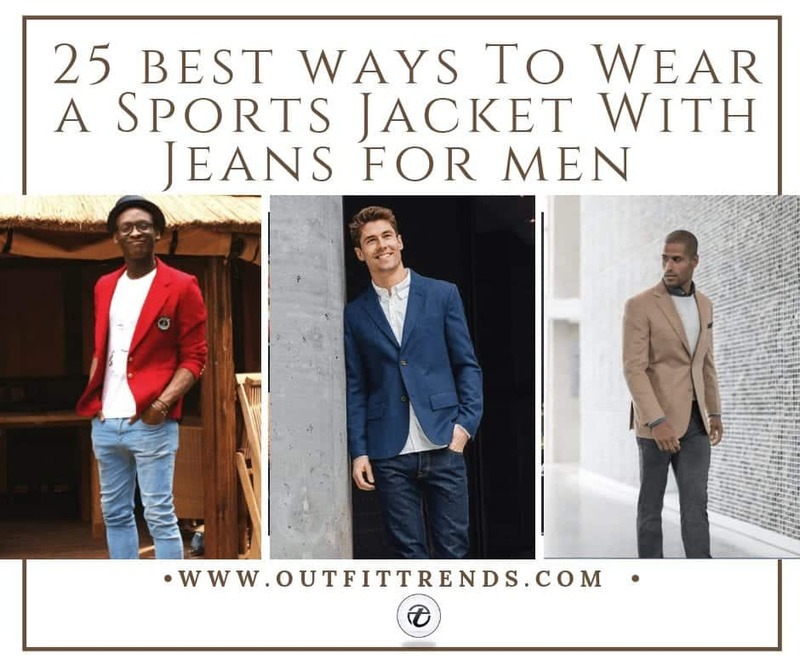 Sports Jacket With Jeans for Men: With the need to ease into an attire that gives you a smart look and is yet slightly laid-back, the sports jacket was created. With the sports jacket, you get the formal look that the blazer offers a fun aspect of not having a strict formal structure. Wearing sports jacket with jeans, however, remains debatable in the world of fashion and dress code ethics. So for those of you who still have a confusion about sports jacket and jeans combo we have gathered certain excellent ways in which you can stylishly wear your sports jacket with jeans and appear awesome. Avoid wearing the sports jacket and jeans combination if you are expected to wear a suit. Take note of whether it is appropriate to go for distressed jeans. Usually, it is best to go for regular-fit dark jeans. Take heed of the fabric of the jacket according to the weather conditions. Don’t choose an overly fitted or short sports jacket. Wearing the sports jacket with jeans is quite controversial in the sense that you might get confused with the mixed opinions people have to offer on how to wear them. Generally, it is considered a faux pas to wear the sports jacket with distressed or cropped jeans, however, you can’t completely overall these combos. Depending upon the occasion and the place you are wearing this combination to, your choices can vary. Here are 17 Ways to Wear Sweaters Fashionably. You should avoid the typical dense black sports jacket and instead go for something that downplays the dark blazer style look that a simple black sports jacket can give to your outfit. Wear a graphic or plain white tee with a classic monochromatic sports jacket and wear it with black jeans and choose unique footwear to bring the dress together. You can find similar cool shoes here. For summer, it is important to look into the fabric of the sports jacket you are wearing because it can make a huge difference. While choosing the sports jacket for summer, try to go for more open weave fabric that will keep you sweat-free under the sun. It is also wise to go for unlined or half-lined sports jackets because they will keep the air flowing and keep you cool along with being elegantly fashionable. Go for light colors like grey or sky blue and patterns that are not overly bold in the daytime. For night events, you can try both bold colors and patterns. Opt for white jeans instead of the blue or black denim and choose a dark color shirt for an impressive look. Plain white sneakers or converse can give you a great casual look. Tired of same old blazers and tuxedo to wear to the wedding? Try a sports jacket for a nice comfortable look that is both smart and effortless to carry. Pair a charcoal sports jacket with dark colored dress jeans and a matching shirt in check. Opt for a silk lined sports jacket that will give you the right look and wear awesome tan boots for you might even need to dance around a little. The sports jacket is very versatile and can be employed for classic street style look. You can wear it over your favorite shirt and jeans and pull back the sleeves. Wear this vintage black hat for a hipster look. Here are 25 Hairstyles for Hipster Men Look. Confused with the stuffy style of a blazer? Try an unstructured black sports jacket for your next special date night and for a dramatic touch and to impress the girl of your dream. Wear a crisp blue or pastel color shirt underneath the jacket and wear it with rolled jeans and sneakers. In case she feels cold, you can always lend it to her to emphasize your gentlemanly nature. Check out these 20 Best Outfits for Men to Wear on a Date. Linen and cotton together can be ideal for a sports jacket because it will feel nice and soft without getting too many wrinkles for special events. This two-button smart navy herringbone pattern sports jacket is ideal for spring wear and can be paired with a white stretch oxford shirt and selvedge jeans. The jacket is lined with chambray so that it will not make you uncomfortable and keep the look of the jacket wrinkle-free. you can find this sports jacket here, the shirt here and the jeans here. You can get out of the conventional styles in which sports jacket and jeans combination is worn and step out and do something different. Wear your sports jacket over a floral print long shirt or any untucked shirt and pair it up with cropped black skinny jeans for a relaxed yet rebellious look. A pair of black or grey loafers will look ideal with this kind of outfit. A modern version of 1950’s preppy look is sporting the corduroy sports jacket in this rich chestnut color over a formal crisp oxford shirt and tie along with light blue faded jeans. A pair of loafers or Oxford shoes will be best to wear with and complement this outfit. The large pockets give you the advantage of more space to keep your things along with the fact that they look aesthetically pleasing. You can find this sports jacket here. Sports Jacket can be sported by mature men too and can be worn with either dad jeans or slightly loose fitting jeans. Go for subtle colors and pattern along with a formal looking shirt and tie to make you appear graceful and elegant. Whether you can wear jeans and a sports jacket combination to office under the pretext of casual Friday attire is still a bone of contention but one that is your call. With a relatively slack dress code policy, you can wear a dark tan sports jacket with two-buttons single-breasted style along with a neutral color shirt and dark colored jeans for a striking formal look. Wear dark suede shoes for a foolproof office attire. Here are 18 Best Summer Jeans Outfits for Men to Stay Cool and Chic. Winter brings freezing icy winds and extremely cold temperature and thus one has to consider the best dresses to choose from that will not keep you shaking in your boots. The sports jacket made from warm fabrics like worsted wool, corduroy, tweed, cashmere etc are the right choices to wear in winter along with the fact that they have a full lining. Take heed to choose slim-fit fleece-lined jeans to wear in winter along with the sports jacket to keep yourself warm. Keep a wool scarf that you can wrap around your neck to feel snug in. leather Brogue boots will go wonderfully with the outfit and will also keep you toasty. 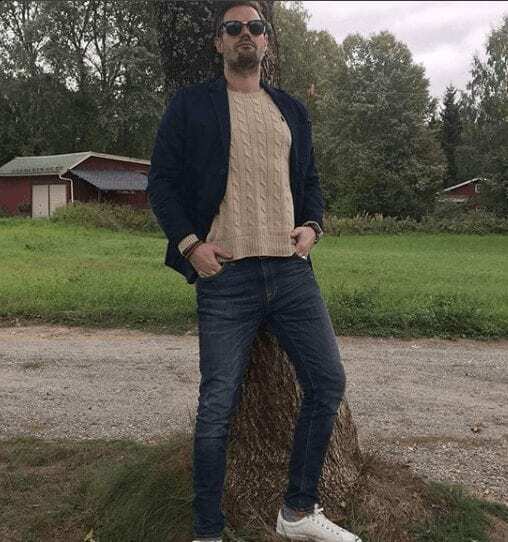 There is often this limbo weather state where you are uncertain whether the temperature will drop or stay high and sports jacket and jeans can be ideal for this transitional period. This classic two-button Chambray ideal fit sports jacket is neither too heavy or too light and can be worn over a tee for an ideal uncertain weather attire. Wear it with moderately light spring jeans to give an interesting twist to the whole outfit. You can find this jacket here. When you decide to go for bright statement pieces of garment, keep the other pieces minimalistic in terms of color palette or patterns. Focus on the sports jacket and build the whole piece around it. Bold colors like maroon, burgundy, yellow, green, violet will throw more light and focus on your attire and wear muted jeans like white denim with it for a restraint chic look. Wear a shirt with similar color checks or strips and you are good to go. Keep the accessories and footwear simple so that you don’t overdo things. You can find similar sports jacket here. You can also carry a very modern look now courtesy of contrasting colors in your sports jacket. Along with the custom-designed sports jacket with contrasting colors, like this cranberry and blue combination, in micro check print, you can wear light shade jeans in blue. You can find this jacket here. When opting for dark colored jeans like black, go for subtle shades and pattern in the sports jacket to create an alluring silhouette. Black and grey greatly complement each other and you can wear a light grey micropatterned sports jacket with black jeans. To create a bright and refreshing look, go for white pocket square and boutonniere. You can wear bright colored loafers to add a twist to this monochromatic outfit. Don’t miss out these 22 Ways To Wear Shearling Jacket. Fretting around on how to upgrade your simple white tee and jeans combination? Well, take a sports jacket in checks with muted shades like tan and blue and you are good to go whether you require this outfit for a formal occasion or a day out with friends. Add a bright blue pocket square for a powerful look and opt for a regular cut or boot cut jeans. You can get your hands on this sports jacket here. If you haven’t had a madras sports jacket in your wardrobe yet, what are you waiting for? This vibrant and cheerful jacket can dapper your simple jeans in no time. Wear it with a crisp white shirt, bright blue or emerald tie and a yellow waistcoat for a classy look. Go for slim fit or skinny jeans and monk strap boots along with cool accessories like white lapel pin and rings. For office parties and events, you have a certain leeway to dress up as you want. You can start with a denim or chambray shirt along with a plaid brown conservative sports jacket and wear this with dark cuffed jeans in blue. A skinny tie is great for such attire. Wear oxford shoes or brogues in tan or brown to go with this outfit. You can find a similar jacket here. Also have a look at these 18 Men’s Outfits with Bomber Jackets. When you are a teenager, you can experiment with different designs, colors, and patterns. A classic windowpane design in green and orange looks great with light colored jeans for a stylish casual look. You can find this sports jacket here. Footwear is essential and the fact can’t be neglected that for various different looks, it will vary. For a boyish-casual look, go with these white lace-on that are extremely comfortable and you can find them here. These black chukka beauties are very versatile and can be worn for a slightly rebellious and attractive look and would look great with black and grey shades of jeans. You can find them here. These handsome dark brown Chelsea style boots and smashing tan brogues boots are great for formal wear and can go well with any shade of jeans. You can find them here and here. Accessories can help upgrade your outfit and make it more attractive. A grenadine silk tie in blue is ideal and versatile enough due to its beautiful texture to go well with most outfits. You can find this blue tie here. If you are invited to a wedding or are feeling fancy, try this white lapel pin that gives your outfit a very fresh and suave look. You can get it here. A gentleman must always carry a watch and this brown leather watch with its soft straps and the graceful look is ideal to wear with sports jacket and jeans. You can get it here. Lastly, appear more formal with beautifully embroidered pocket squares and you can take your pick from here.